Minimum RM15 donation per entry. 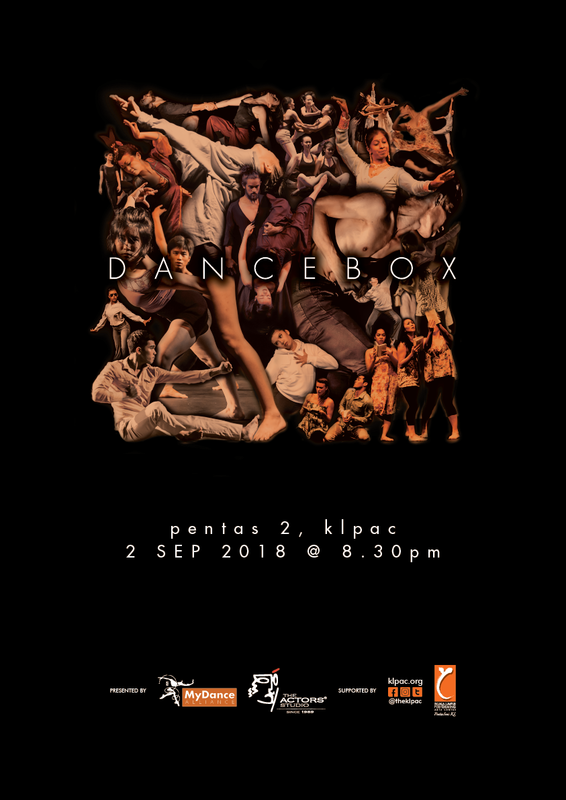 Supported by the Kuala Lumpur Performing Arts Centre, Dancebox is a regular platform to showcase emerging choreographers, or experimental works by established choreographers from Malaysia. Tay Yi Xuan and Yap Chiw Yi will perform short solo works filled with theatrical magic, by choreographer LENG POH GEE. Leng Poh Gee holds a Master of Arts (Performing Arts) from University of Malaya and Bachelor of Science (Human Development) from Universiti Putra Malaysia. He has served as a lecturer in the Dance Department, University of Malaya (2005-2016); Vice President of MyDance Alliance (2013-2018); dance notation facilitator to the Johor Heritage Foundation (2011-2012); and has been one of the dance judges for the BOH Cameronian Arts Awards (2011-2016). He is currently a dance lecturer in the Faculty of Music and Performing Arts, Sultan Idris Education University; and translator of LANGKAH, a bilingual online journal for local contemporary dance. ASWARA student MOHD NURIQRAM is creating a new dance work with a group of outrageous young local dancers. Mohd Nuriqram Bin Azhar is a second year Bachelor of Dance with Honours student in ASWARA. He represented Malaysia to the ASEAN-CHINA Joint Cultural Performance in Siem Reap, Cambodia. He was one of the finalists for Bakat Ohsem Malaysia Competition 2017. He has collaborated with the Faculty of Theatre ASWARA in the theater production Cus Cus Cus. He has also been involved in productions organized by the faculty of dance ASWARA such as Main Zapin, Gelombang Baru, Jamu, Drama Tari Hang Li Po, Aduh Seroja and others. He created Kurang Kasih Sayang (2017) and Out of Coverage (2018) for the Gelombang Baru production at ASWARA. HAFZAL AZIZ will present his gorgeous lyrical dance work ‘You’ performed by four women from the University of Malaya dance department. Originally from Kuching, Mohd. Hafzal bin Aziz is a graduate in Bachelor of Performing Arts (Dance) in 2017 and currently pursuing his study in Master of Performing Arts (Dance) at University of Malaya. An instructor and dancer of NusPARC Dance Company (NDC), he has choreographed contemporary works ‘Gemalai’ for Young Emerging Choreographers in 2015 and ‘You’ for UMa Dance Showcase 2018. He has been performing, teaching and choreographing traditional dances, and has performed in contemporary dance works by Jack Kek, Leng Poh Gee, Rathimalar Govindarajoo, Rozilah Abd Rahman, Hamid Chan, and Joelle Jacinto. He has recently appeared with NDC in the Philippines and Taiwan. JS WONG will present his solo dance work performed by fellow UM Dance Department faculty member Khairi Mokhtar, in the next Dancebox, this Sunday 2 September at Kuala Lumpur Performing Arts Centre. Wong Jyh Shyong (JS), born in Seremban, Malaysia, is currently a dance artist who is thinking, creating, performing, and teaching dance. He received his Master of Fine Arts from Graduate Institute of Choreography, Taipei National University of the Arts in 2013 and Bachelor of Fine Arts from The Hong Kong Academy for Performing Arts with First Class Honors in 2005. He was previously a dancer with Cloud Gate Dance Theatre of Taiwan from 2005 to 2009. In the 9th and 11th BOH Cameronian Arts Awards in Malaysia, he received the Best Featured Performer award. From 2013 to 2016, he was the artistic director of DPAC Dance Company as well as Damansara Performing Arts Centre. JS has staged his own works and commissioned pieces in various festivals and venues in Australia, Taiwan, Hong Kong, Singapore, Japan and India. He is now a lecturer in dance department at University of Malaya. Interdisciplinary artist LIM PAIK YIN will present is creating a new group work. Paik Yin’s work uses the human body as a visual motif to explore the various ideologies and political forces that shape attitudes towards the human bodies. She started choreographing and performing site specific works in Malaysia and Indonesia from 2014 onwards. Currently she is pursing her Masters in Visual and Media Anthropology after 5 years working as a photo researcher in a stock photography company. Her photography work has since evolved to including her practice in performance art. She is influenced by permaculture and her dance practice in contact improvisation and Butoh. FAHEZUL SUHAIMI aka ROMO is making a new group work. Fahezul Azri bin Suhaimi was born to a Sabahan family in Kuala Lumpur. He graduated with a Diploma in Dance (Performance) and Degree in Dance majoring as a performer at ASWARA. Currently working as a choreographer and dance captain under Pat Ibrahim Project Entertainment, he is highly influenced by genres such as hip hop, contemporary and traditional dances. Amongst his achievements and involvements are performing in ‘Flatland’ choreographed by Suhaili Micheline, ‘Tentang Cinta’ by Khairulazhar Mohtar, ‘Seru’ by Joseph Gonzales, and the musicals ‘P Ramlee’ and ‘Supermokh’. He has also performed in festival, competitions and events in Korea, USA, and Indonesia. His short dance works ‘Liku’, ‘bida’, ‘Puissance’, ‘Halus’, ‘Hidup Bersama’ and the recent ‘Voginang’ have wowed the crowds in platforms like Gelombang Baru, Short+Sweet and Dancing in Place. MATT TAN is a full-time choreographer and dancer. He has worked with Asian Musical Production (2012-2016) and was nominated as Best Featured Dancer at The BOH Cameronian Arts Awards in 2016. His works such as 《我愛你，塞北的雪》，《源滴湧潮》，《回首》，《鄉間物語》have won several rewards in the National Chinese Dance Competition Malaysia in 2012 until 2014. In 2016, 《奼紫嫣紅》 obtained First-Runner Up and the Best Choreography award and in the following year, 《芳心花語》was awarded Champion and the Best Choreography award. Recently, his piece ” Friend” won the Gold Award at the 8th National Chinese Cultural Dance Open Competition and will be competing at the Bauhinia CupDance Championships at Hong Kong.